Theralase is a medical laser designed to stimulate tissue repair, reduce inflammation, and eliminate pain. There are two types of medical lasers; those that generate heat and are used to cut through tissues, and cold lasers, like Theralase. Theralase is a non-invasive treatment option and will not damage tissues. Instead, Theralase is designed to help speed your recovery time and provide quick relief from inflammation. 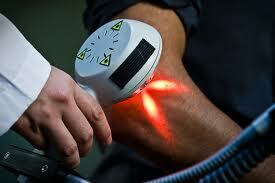 Theralase laser therapy is safe and painless, with immediate results and no side effects. At Westport Chiropractic and Acupuncture, our Westport chiropractor is trained in Theralase treatment methods and when you schedule your free consultation, we will work with you to determine if Theralase is right for you. You can either call us at (203) 779-6113 or contact us online to schedule your free consultation with one of our chiropractors. Find out if Theralase in Westport is right for you! If our chiropractor determines that Theralase treatment is right for you, our friendly staff will help you schedule your treatment. Sessions can range from 2 minutes to 20 and the number of sessions you receive will also vary based on your personal needs. Our Theralase chiropractor in Westport will work with you to ensure that you are receiving the appropriate treatment for your individual condition. Theralase is a proven medical treatment and our team is prepared to answer any questions you may have. Established in 1985, our Westport chiropractors have over 100 years of combined experience and are committed to helping you feel better. At Westport Chiropractic and Acupuncture, we want to help as many people as possible get well and stay well through innovative chiropractic services like Theralase laser therapy. When you call us, you will receive the top-quality care you expect and the compassion and respect you deserve. At Westport Chiropractic and Acupuncture, we treat you like family. To learn more about Theralase laser therapy, schedule a free consultation with our Westport chiropractor today. Call us at (203) 779-6113.